We had friends over for dinner and I decided to make these tacos because everyone was craving Mexican food. 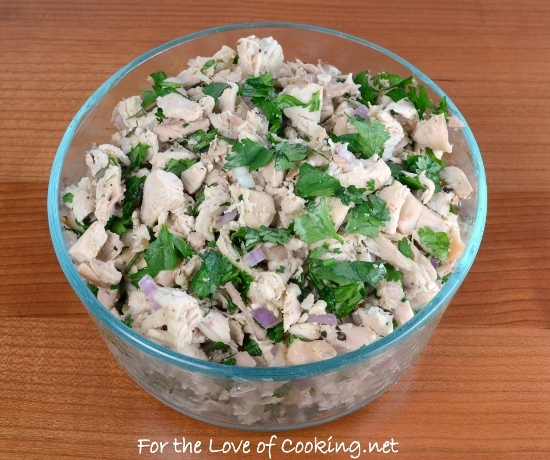 I chopped up some leftover roasted chicken along with some red onion, cilantro, lime juice, and seasonings. 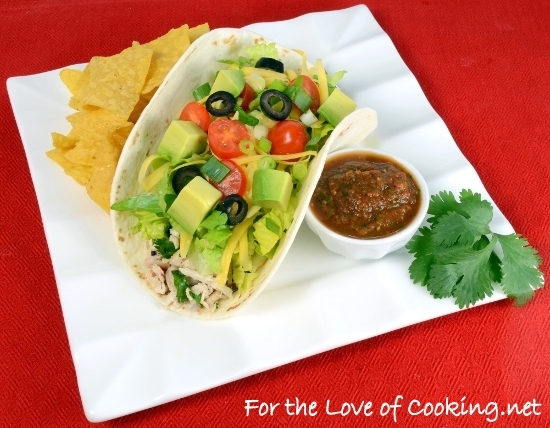 The chicken was flavorful and delicious and tasted great in the tacos that I topped with lettuce, tomato, green onion, black olives, fresh avocado and sharp cheddar cheese. I served these tacos with the Spicy Fire Roasted Salsa along with sour cream. My kids loved the tacos and so did the rest of us. 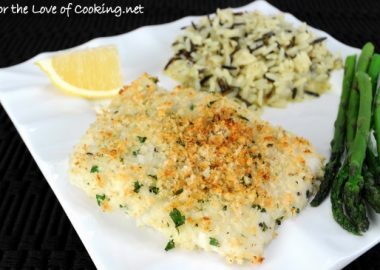 This was a quick and simple dinner that tasted great. 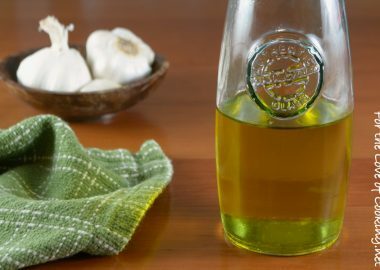 Roast the chicken using this recipe or use a store bought rotisserie chicken and remove the skin and bones from the meat. Chop up the roasted chicken along with the cilantro, red onion, lime juice, oregano, cumin, garlic powder, sea salt, and freshly cracked pepper, to taste. Mix thoroughly until well combined. Taste & re-season if desired. 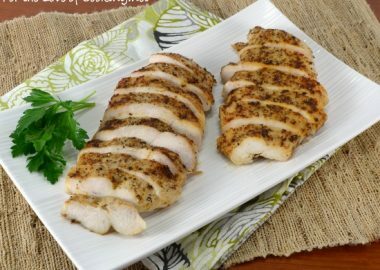 Heat the chicken (covered with a paper towel) for 30-45 seconds in the microwave right before serving. 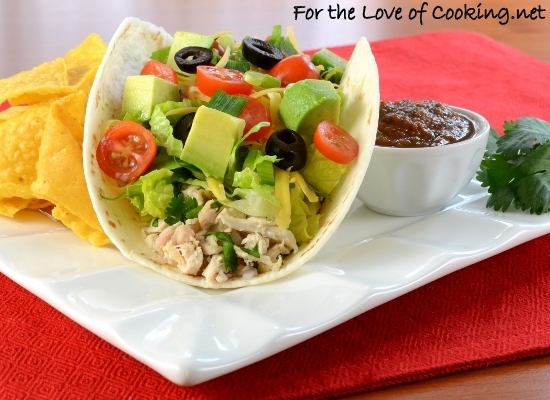 Heat the flour tortillas, wrapped in a towel, for 30-45 seconds or until warm and pliable. 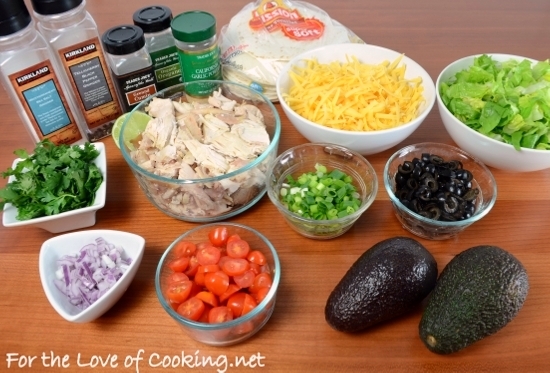 Spread the chicken mixture down the center of the tortilla then top with lettuce, sharp cheddar, tomatoes, green onions, olives, and avocado. Serve with a side of salsa and sour cream if desired. Enjoy. Chop up the roasted chicken along with the cilantro, red onion, lime juice, oregano, cumin, garlic powder, sea salt, and freshly cracked pepper, to taste. Mix thoroughly until well combined. Taste & re-season if desired. 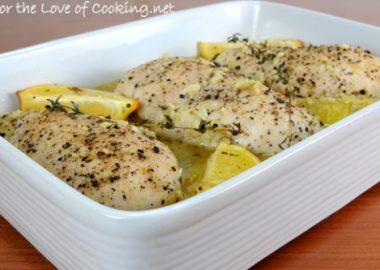 Heat the chicken (covered with a paper towel) for a 30-45 seconds in the microwave right before serving. I have recently started having mexican food and I cannot get enough of tacos. Love your recipe. Yes please! Now I’m totally craving mexican food at midnight! 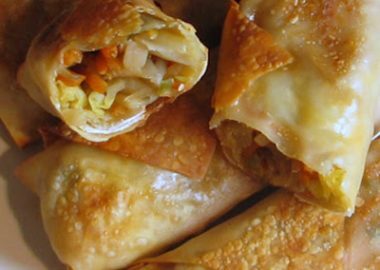 Love the combination of flavors… simple and perfect!! 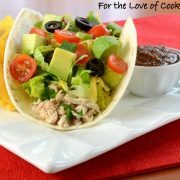 I love making tacos on weeknights and these look perfect, Pam! So great for “making your own” dinner with friends and family. Perfect! I know what I am having for dinner tomorrow. I can hardly wait..just need to get some cilantro and I am good to go! Love the salsa + taco recipe you posted. Also, your tacos are so pretty in the pictures. Tacos for dinner never fail to please! Love the flavors in these! mmmm, i love me a good taco! these look wonderful! Oh my they look delicious! Love the avocado in there! 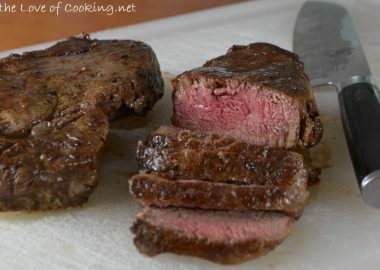 What kinds of chickens do you roast to get such clean looking meat? This taco is making hungry, it looks so good. 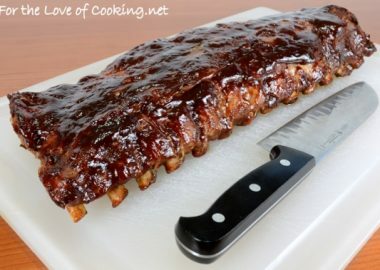 This would be a great weekend lunch! Love simple and delicious food. now this is my kind of meal. I’ve been eating an avocado a day now for a few weeks; just cannot get enough of them right now.